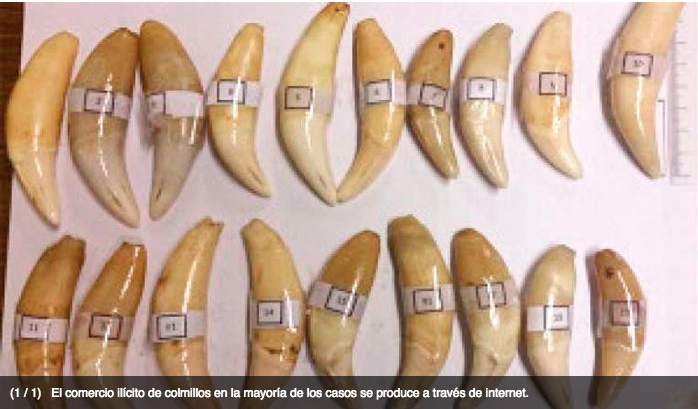 The illegal trade of fangs in most cases occurs through the internet. The fifth Criminal Investigation Judge of the city of La Paz, Juan Carlos Moltabán, ratified the three-year prison sentence against two Argentine citizens, convicted of trafficking jaguar tusks and cougars, the Environment Ministry reported. According to the government entity, the Argentines Claudio Quintana and Aaron Vargas were arrested in January, when they flagrantly trafficked more than a hundred jaguar and puma tusks, as well as feathers of wild birds. The defendants underwent an abbreviated trial and received a sentence of three years of imprisonment, but asked to benefit from parole, arguing that it is a minor penalty. The judge considered that, in crimes related to Mother Earth, the figure of conditional suspension of punishment does not apply, in accordance with Law 300, Framework of Mother Earth and Integral Development for Living Well. In that understanding, decided to ratify the prison of foreigners. For the Ministry of the Environment, the sentence constitutes an important judicial precedent, which will strengthen the legal defense of the components of Mother Earth, such as wildlife. It was discovered that traffickers generally operate in criminal associations; and in several cases it was identified that there is complicity of some community members for hunting animals for commercial purposes. Part of this illicit trade takes place through the internet, where there are still no appropriate surveillance mechanisms to identify the traffickers and their potential customers. This entry was posted in Bolivia, Crime and Violence, Environment, Social Unrest and tagged biodiversity, endangered species, environmental awareness, government failures, illegal, wildlife. Bookmark the permalink.